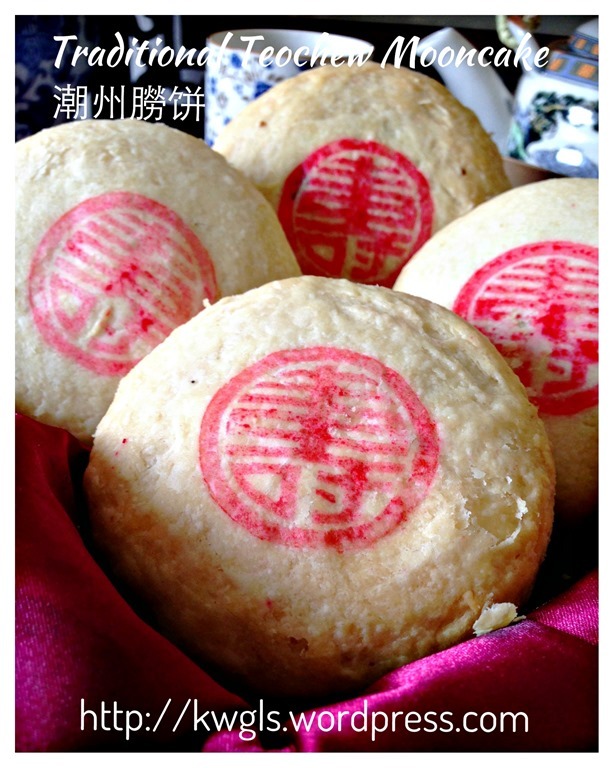 When I told Facebook friends of members that this is my favourite childhood moon cake, many seems to read in doubt and some claimed that it looked like the marriage cakes. 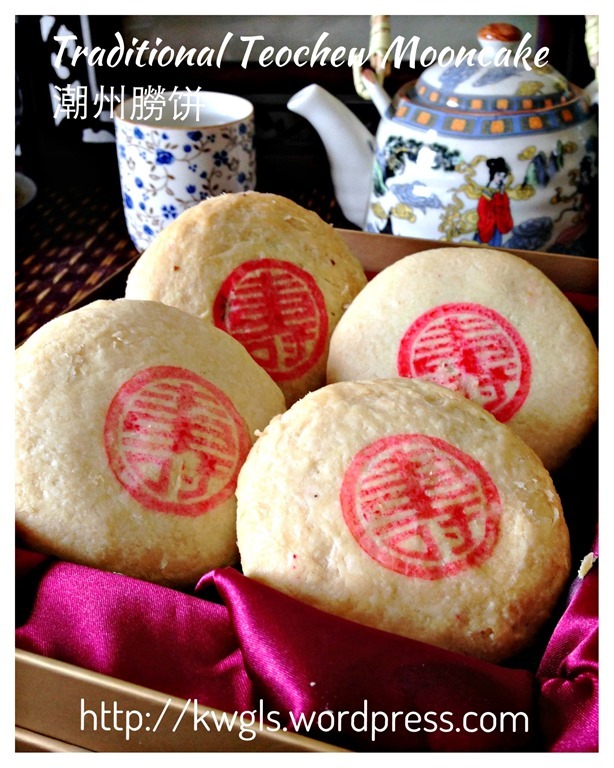 Yes, in fact it is a smaller version of Teochew marriage cakes. When I further told them that it is a very traditional Teochew dialect moon cake, some disclaim that “it is Teochew Moon cake” because most Teochew moon cake should be the yam moon cake with spiral flaky skin. I really have a hard time to justify my moon cake. 2 days later, I decided to prepare some moon cake which is much smaller in size and usually sold in a white tube wrapped with red paper. 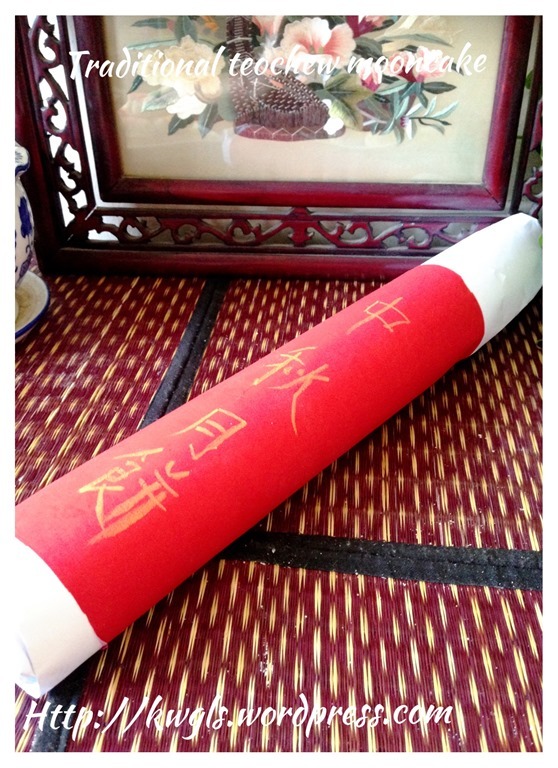 Insides the tube, there are 10 small moon cakes which my mum used to buy this for praying to the Goddess of moon. 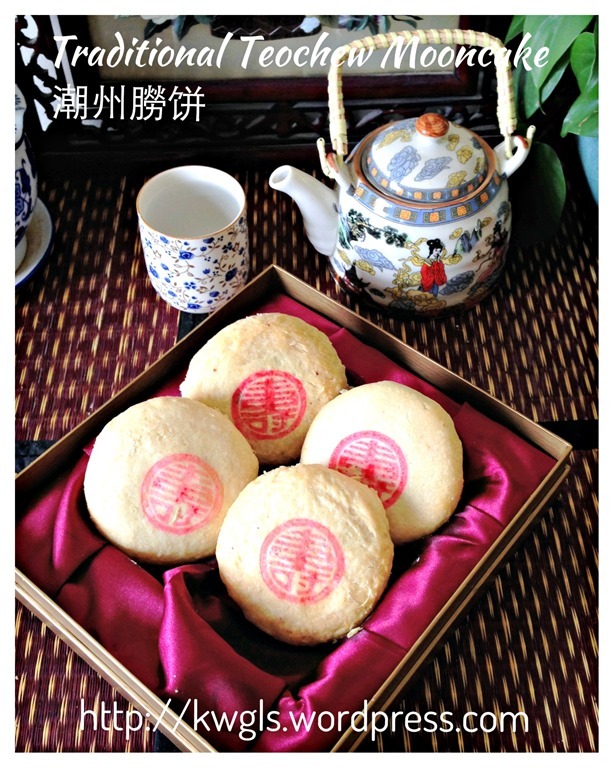 With this packaging, some are able to recall the moon cake and said that the cake brings them fond memories. What I am sharing today is a type of traditional flaky skin moon cake which in existence well before the existence of the yam spiral moon cake. It usually comes with the white mung beans fillings and was called “la pia” or “朥饼“。 During the time when my late father worked for a Teochew bakery, then , it was prepared using lard as one of the important ingredients. However, in recent years, most bakery have started using lard and use vegetable oil instead. 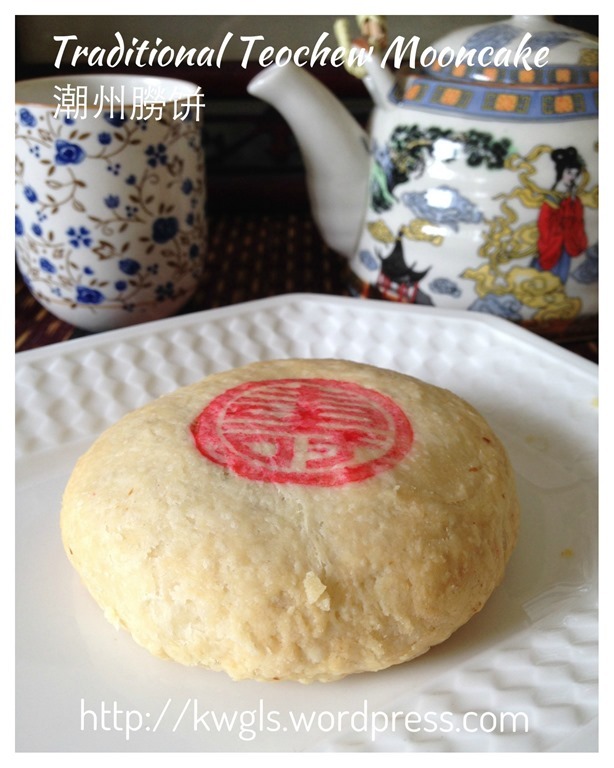 For those who understand Mandarin, it was written in an article that the moon cake of Chaozhou and Shantou are characterized by its thin flaky skin and luxurious thick mung bean fillings. 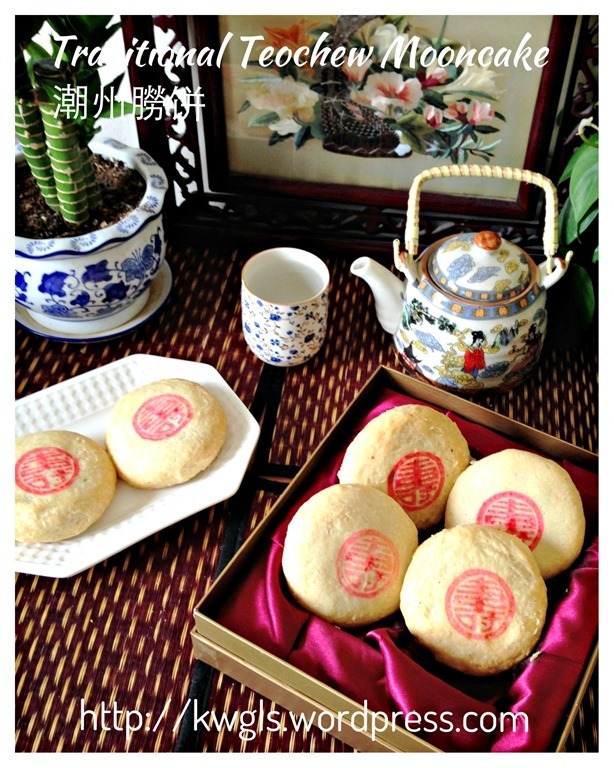 For those who are interested in this traditional moon cake, you may want to refer to the link before to read more about the various regional variations of this Teochew traditional moon cake. This is not a difficult recipe and rather basic. There are still many variations for this Teochew moon cake and some have candied winter melon, pork belly, tangerine peels, sesame seeds and etc. If you have never tasted this before, it taste exactly like the sweet “tausa pia” commonly sold in the Teochew bakeries. 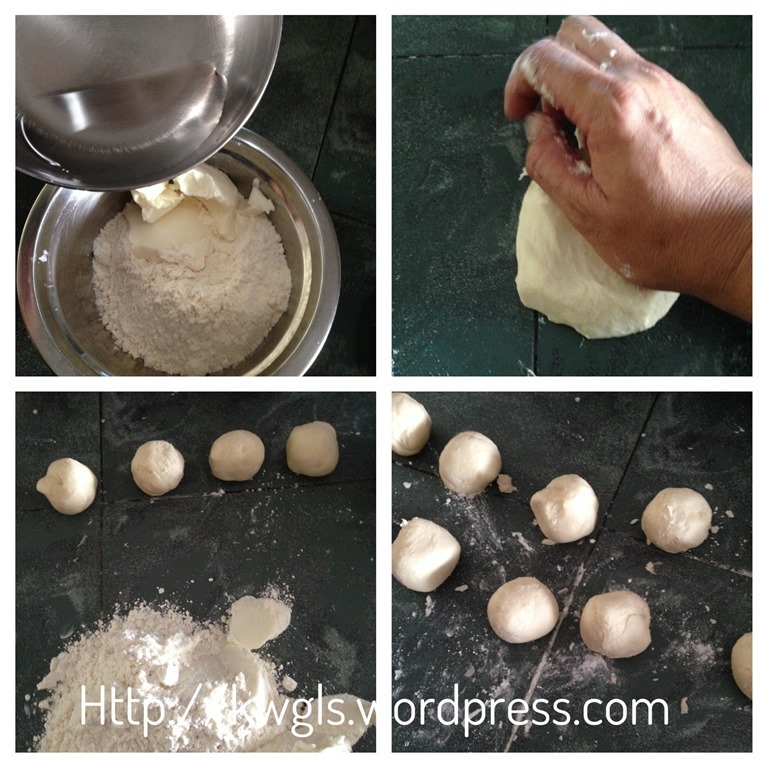 Mix all ingredients for the water pastry in a bowl, mix and knead until it form a pliable dough. Divide into 6 balls. Set aside. 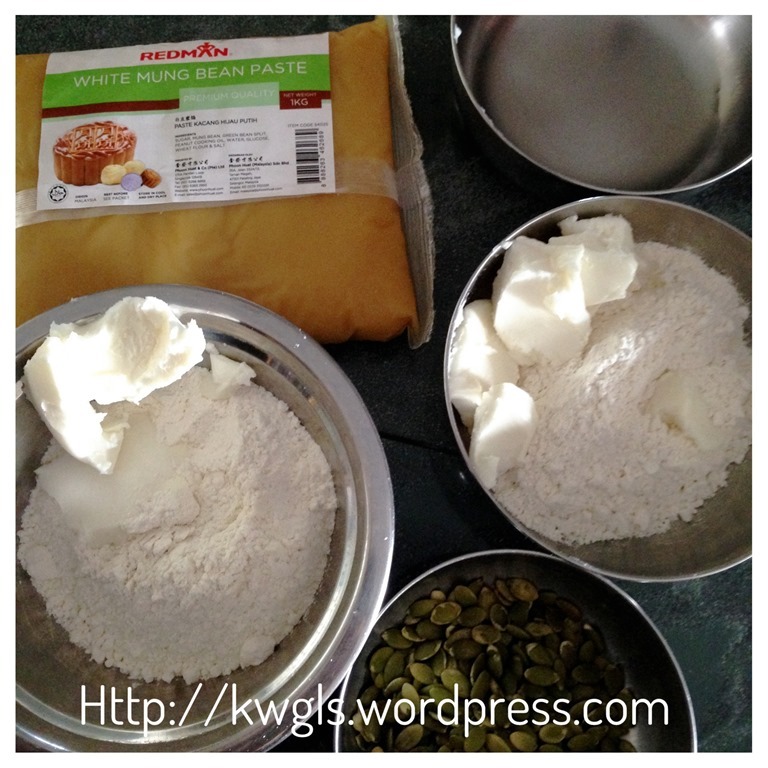 Perform the same for the oil pastry. 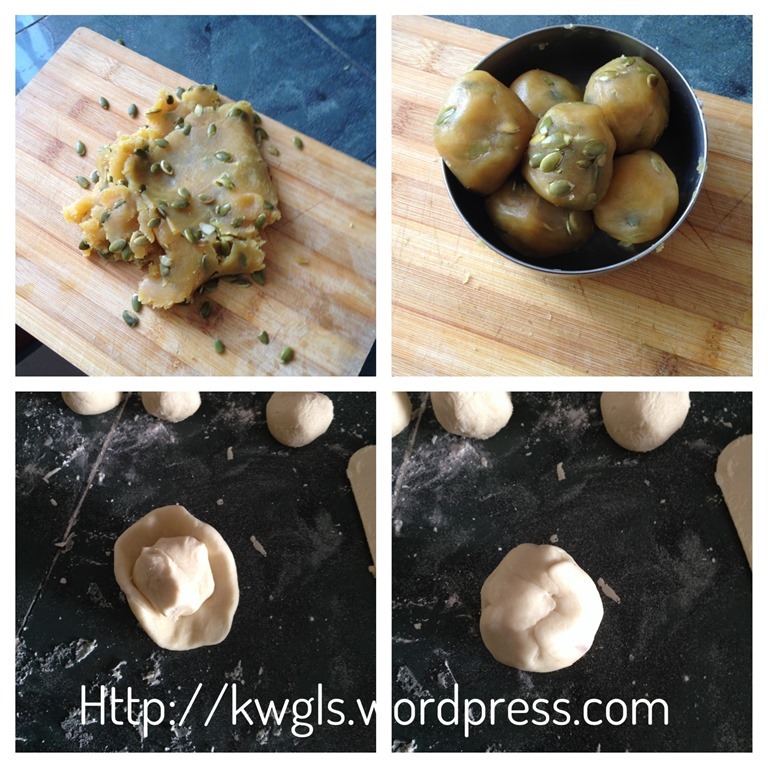 Put the mung beans paste and pumpkin seeds in a bowl, knead until well mixed and divide into 6 balls. 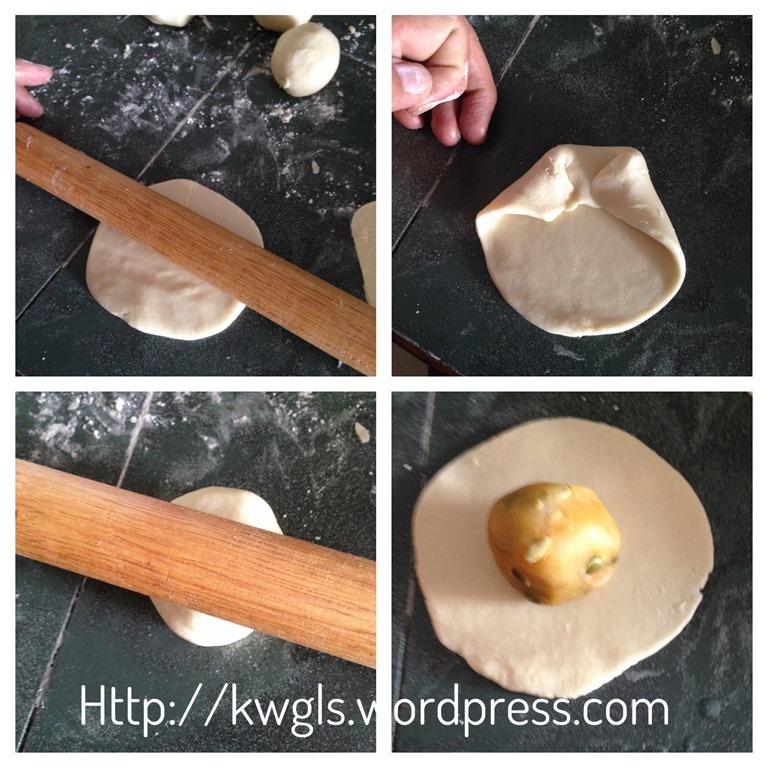 Wrap one ball of oil pastry with the water pastry. Seal the edges and shape it into a ball. 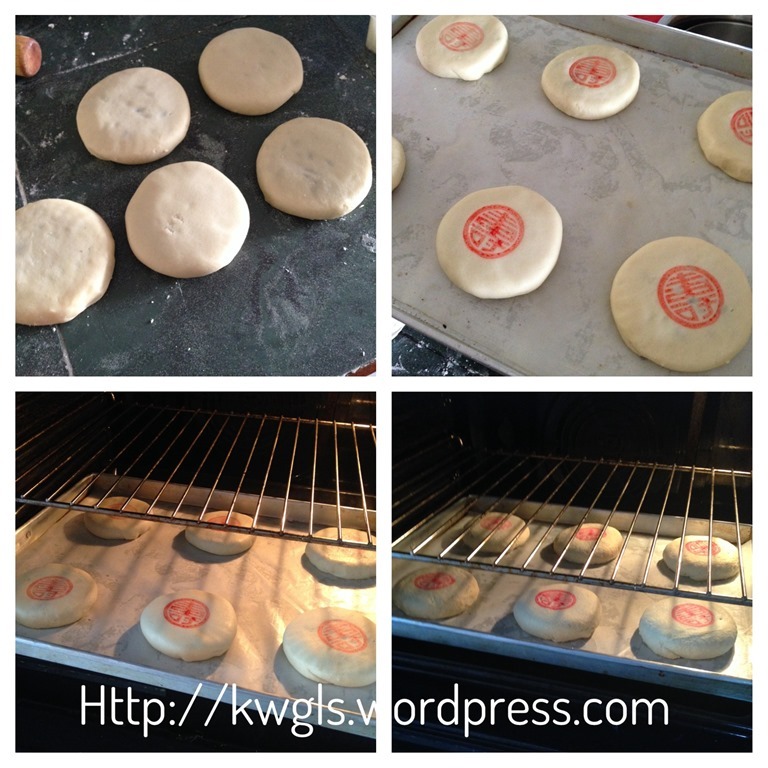 Seal the edges, shape like a ball and use a rolling pin to lightly roll it flat. Chop on top of the cake red chop of your choice. Repeat the same for the remaining 5 cakes. Bake in the pre-heated oven of 180 degree Celsius for 20-25 minutes. 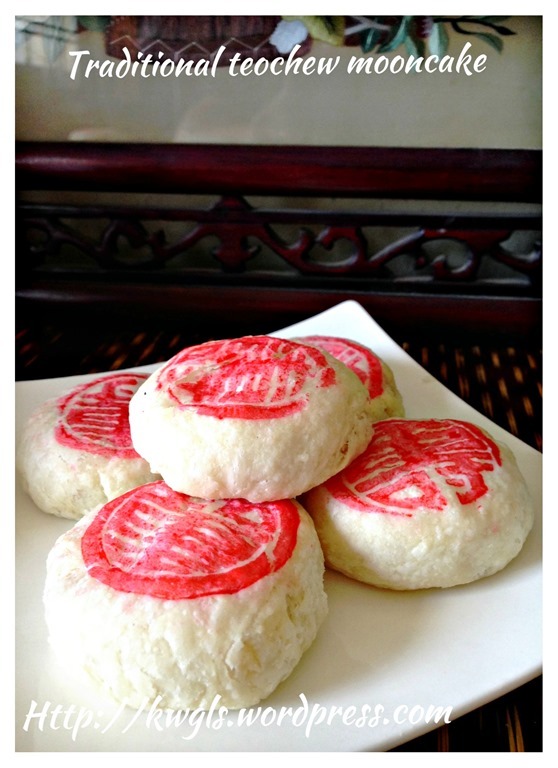 This is the type of moon cake that capture my heart. It brings fond memories and my niece still bought this for me, deep frozen in the fridge and passed it to me when she meet me months later. 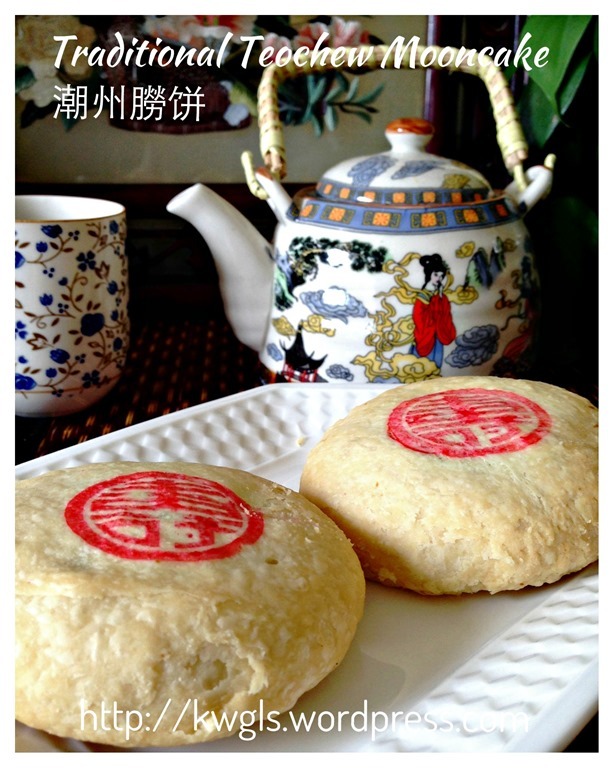 In recent years, I have difficulty to get this bigger size moon cake as its popularity have been dwindling rapidly. For the smaller tube type of packaging, I have not bought for years because it usually comes with a very thick skin, little and hard fillings . 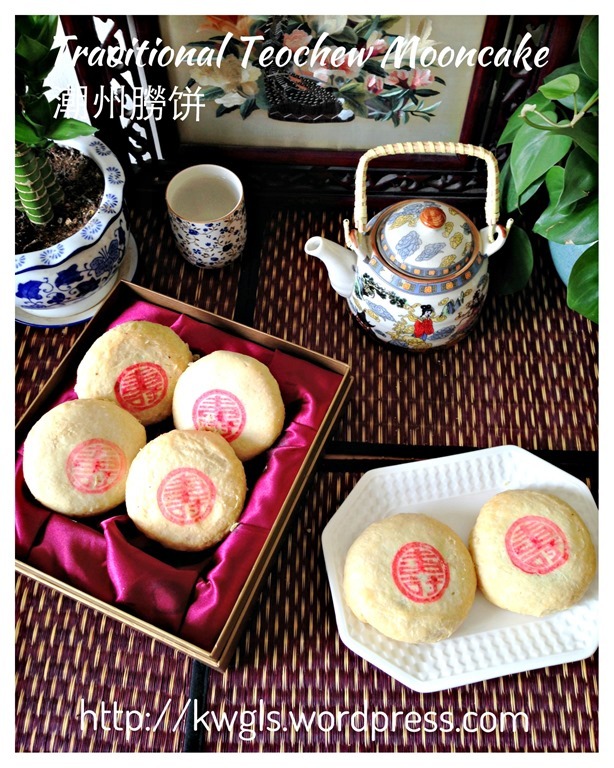 Some of these moon cakes may have been prepared months ago and by the time it reach the customer, most of the moon cake are not fresh and start to harden. However, homemade freshly baked moon cake is a totally different story. It is flaky with lots of fresh fillings. 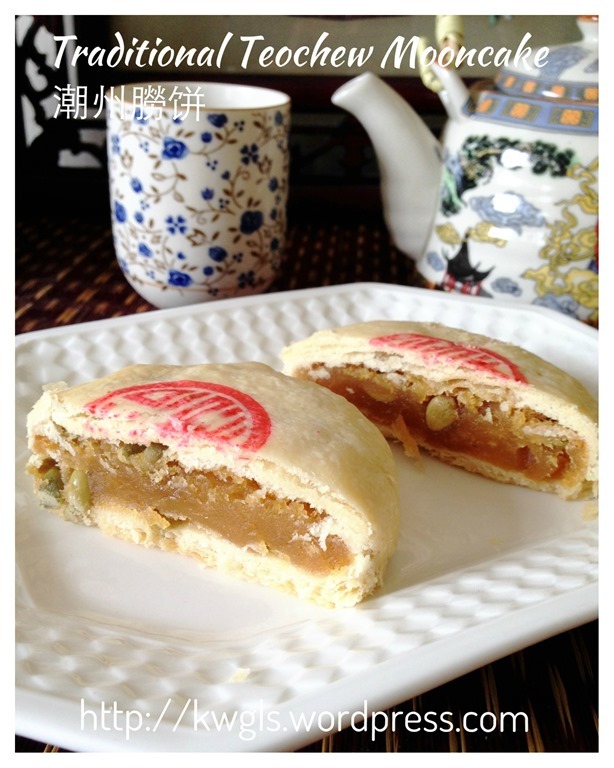 I have decided to blog this rather niche moon cake to satisfy my cravings. 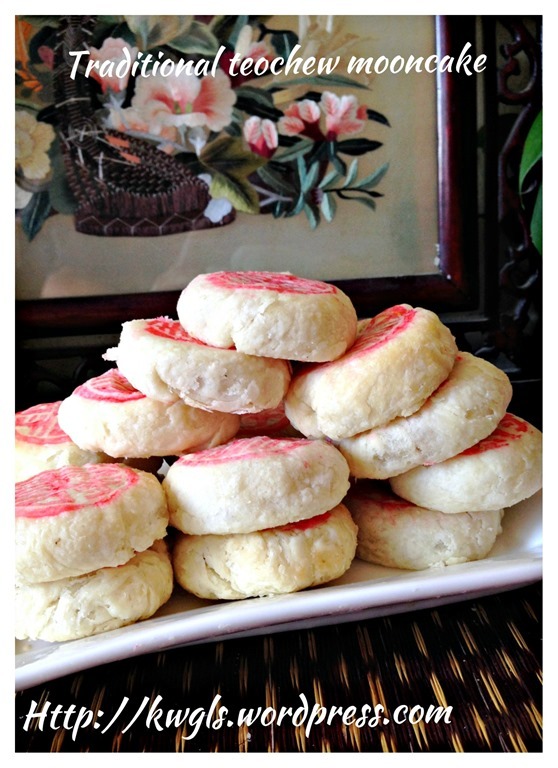 This recipe was included in Page 20-21 of the “Easy Mooncake Recipes E-book”. 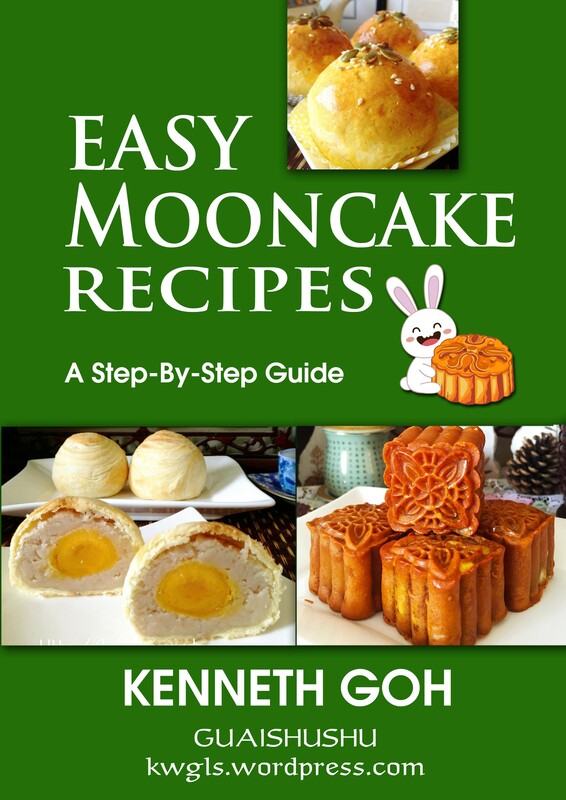 For more mooncake recipes, you can have a copy of “Easy mooncake recipes – A step by step guide” that was packed with 20 recipes, 45 pages at a reasonable convenience fee of USD4.00. 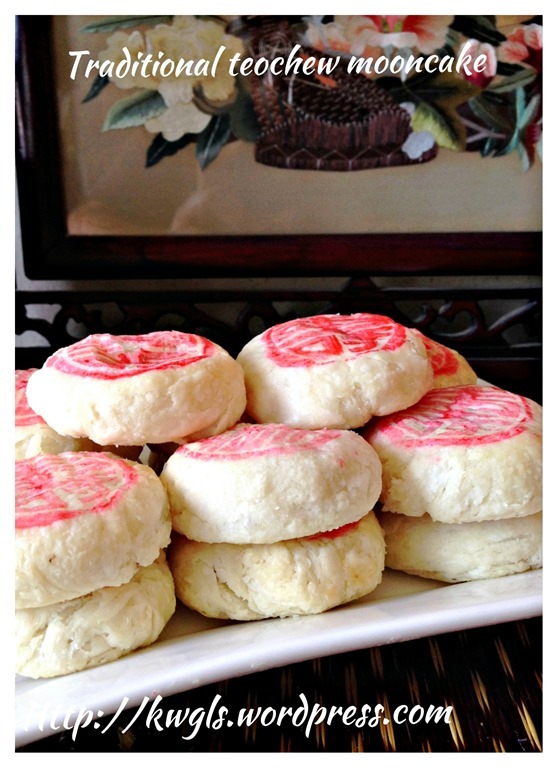 The recipes covered various recipes from durian mooncake, traditional baked mooncake and also the less common Teochew mooncake . You can purchase by clicking the link above.You can either pay using Pay Pal or Credit card account. Please ensure that you have an PDF reader like Acrobat or iBooks in your mobile phone or iPad if you intended to read it in your ipad or mobile phone. Should there be any problems of purchasing, feel free to contact me at kengls@singnet.com.sg and separate arrangement can be made. 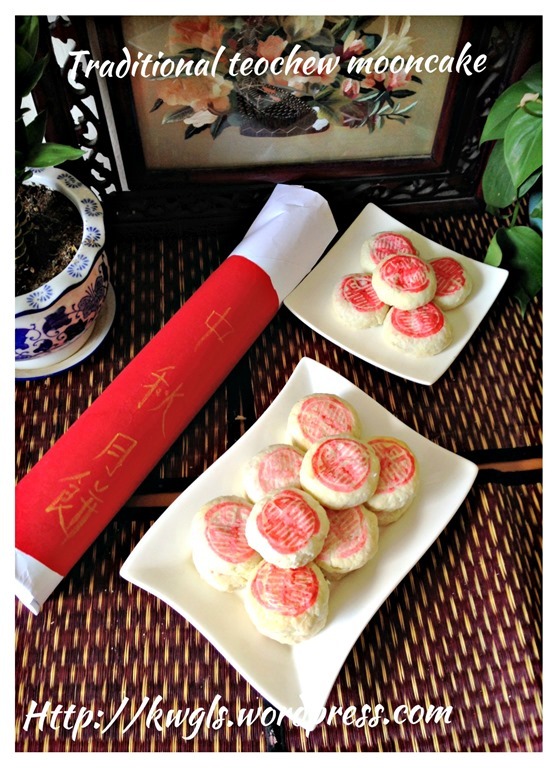 This entry was posted in Chinese and Asian Cakes and Snacks, Food Preparation Series and tagged 8, GUAI SHU SHU, Guaishushu, kenneth goh, la pia, postaday, Teochew Flaky Mooncake, Teochew Moon cake, 朥饼, 潮汕朥饼. Bookmark the permalink. Kenneth this looks so much like the mooncakes my Grandma made when I was little. It really brings back memories. And a bit of tears. Thanks for sharing! Never tasted this before even I’m a Teochew. Such a shame! May be I can give it a try this year. Thanks for sharing. Thank . Thank. I did it , pastry is very flaky.many thank I learn from yourxxx. Hi Kenneth, thank you for sharing tis recipe! Tis mooncake was my late Father-in-law’s favourite. I tried today and it tasted really good! But I was struggling with the dough as the shortening was kind of ‘melting’ and I kept using alot of flour to salvage. Any tips that u cn impart? Tank u so much! lovely moon cakes. 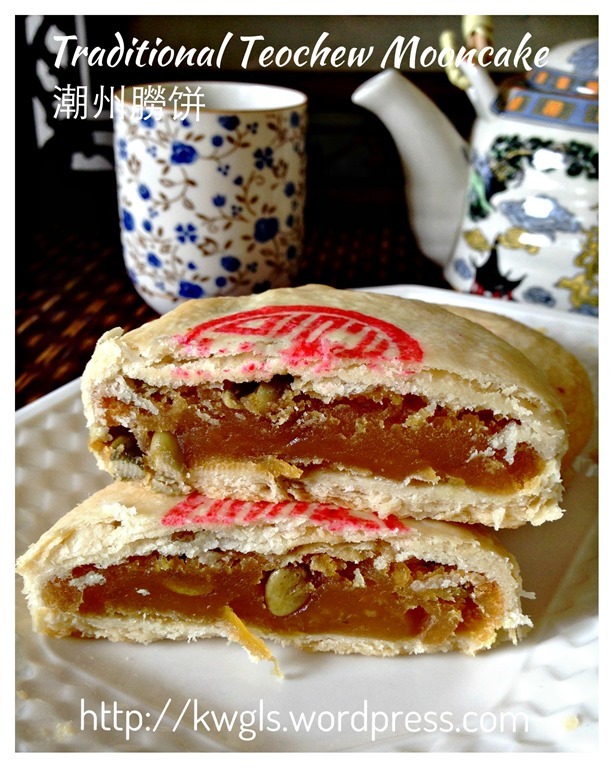 I love this kind of flaky skin moon cakes. May I know where is a place to get the red cake stamp? It was a hand gift from Hong Kong. Unsure where you can get this in Singapore. Hi Kenneth, will you able to share mung bean paste recipe? Or We can buy off the store?